Good afternoon, everyone. I have to move a bit faster than normal today because there's a lot of material to cover. But you should still ask any questions that come to mind. First the good news: yesterday's post on introductory Coincidence and Anomaly Theory, "CAT 101", has been nominated for an award! That's right! Listen: the man in the photo is James Randi. At his website, the James Randi Educational Foundation, there's a forum where they "discuss skepticism, critical thinking, the paranormal and science in a friendly and lively way". And in that forum there's a monthly award for the most remarkable post of its kind. They don't waste any time in that form: Even though it was only posted yesterday, "CAT 101: Introduction to Coincidence and Anomaly Theory" has already been nominated for September's Stundie award. a real and obvious link to conspiracy theories, but not exclusively 9/11 conspiracy theories. Naturally, most of the nominees for this and previous Stundie awards have come from people who question the official story of 9/11. Many of them do so in incredibly clumsy ways, citing "facts" which have not been corroborated, stringing together nonsensical "arguments", and/or speling they're wirds verry baddly. "CAT 101" quotes some words which were misspelled in the posts where they first appeared, but with the necessary edits indicated. So the post can't be faulted for spelling. And the facts it provides not under dispute, so there's no way to fault it on that count. What's left? Of course! If it dares to question the official story of 9/11, then by definition it must be stupid! Here's the interesting thing about Coincidences and Anomalies: If you're a good Coincidence and Anomaly Theorist (CAT) you never have to admit anything. I say 2 + 2 = 4. CAT says no it isn't. I take two balls and put them on the table. Then I take two more balls and put them on the table. Then I count the balls. 1, 2, 3, 4. Here's my proof, I say: 2 + 2 = 4. But I just laid it out on the table, says I. That's the proof. CAT says no that's just a coincidence. So I do it again. Get the same answer. Is that a coincidence too? I ask. CAT says no that's an anomaly. Turns out you can pile up as many coincidences as you like and CAT says that's just an anomaly. Or you can pile up a bunch of anomalies and CAT says that's just a coincidence. If there's anything worse than plain stupid, it's stupid trying to be clever. I don't expect to win, but it truly is an honor to be nominated. And this is quite a significant nomination, so the honor is most appreciated. But that's not all. Who scheduled all the wargames that took the Air Force away from the Eastern Seaboard that day? Did Osama bin Laden schedule the wargames? 118 first responders (fire and medical personnel) who were at Ground Zero on the mor[n]ing of 9/11, reported seeing or hearing bombs or explosions in the bui[ld]ings before they crumbled. Why is that? Is this a conspiracy o[f] eyewitnesses? Why did Bush and Cheney insist on testifying together, and not under oath, and why did they insist that no notes of their testimony could be kept? If they weren't trying to hide anything, why would they act like they were trying to hide something? stupid trying to be clever. See how that works? Nice, isn't it? There's more, and it's even better. In a subsequent comment, Horatius the Illuminator trumps Maccy in every respect, pointing out that another passage in the same post is "even worse". How does he do this? By quoting the text shown below and portraying it as "complaining" about other "coincidences". This despite the fact -- an obvious one, I would have thought -- that I was not complaining, and I certainly wasn't calling these things "coincidences". I was saying just the opposite: that a good Coincidence and Anomaly Theorist could "disappear" all challenges to the official narrative of 9/11 simply by labeling them "coincidences". They aren't even coincidences, at least as I u[n]derstand the term. Note the use of the word "even". They aren't even coincidences. In other words they are less than coincidences; they are of no account whatsoever. According to the Illuminator, these gaping holes in the official story of 9/11 are not even coincidences and therefore, obviously, the questions they raise require no answers. It's a beautiful technique, isn't it? Far beyond anything we covered in "CAT 101". This Horatius fellow must be a pro! Thoroughness is a sign of an excellent educator -- it's a sign of a professional, too. And Horatius is nothing if not thorough. Thus Horatius the Illuminator provides a final example of his style of Illumination: He nonchalantly distorts the basic idea of the post in order to imply that it's the post, rather than the Illuminator, that should be nominated for an award. For the benefit of Maccy and Horatius as well as any other Graduate Posters or Illuminators who happen to be reading ... I'll ... type ... this ... next ... part ... very ... slowly. I do not think, nor have I ever said, implied, or hinted that "disagreeing with [my] interpretation of any of the above is just exactly like arguing that 2+2 doesn't equal 4". I am saying something completely different. I am saying: Dishonest people who know a few slimy rhetorical tricks can find a way to deny anything. In "CAT 101" we saw a few of the slimy rhetorical tricks that CATs like to play, courtesy of the anonymous poster who was quoted there but (of course) not mentioned in the Stundie thread. Here, in "CAT 102", we have seen some of the more advanced tactics. This one [...] boggles my mind [...] it's stupid trying to be clever. Blame logical fallacies on those who point them out rather than those who commit them. I wasn't complaining about these things nor was I calling them "coincidences". I was saying just the opposite: it's not very likely that they are "coincidences"; therefore they require a more sensible response then simply dismissing them as "coincidences" or "anomalies". These are all good lessons but there's another one hidden under the rug here, and it's even more important. If your opponent makes a statement you can't refute, pretend it never happened. The FEMA report says that its best hypothesis about the "collapse" of WTC7 has a "low probability" of occurrence. In other words the report itself admits that its conclusion is incorrect. Six years after the event NIST still hasn't even issued their report about it. And while we were waiting we found out that BBC broadcast a report of the fall of WTC7 before it even happened. I say these are massive indicators of coverup and foreknowledge, respectively. What do you think they are? Coincidences? Or anomalies? They're not even coincidences! How can you be so stupid? How am I doing so far? Do I seem to be catching on? It's starting to feel more natural now, you ignorant clown! Oh yeah! That's sweet!! I think this is gonna work out fine. What are you staring at, you knucklehead? What's the matter with you? Are you retarded? Or are you a conspiracy nut? Ah, I forgot: there's no difference!! This is great! See how fast you can learn when there's a good example to follow? 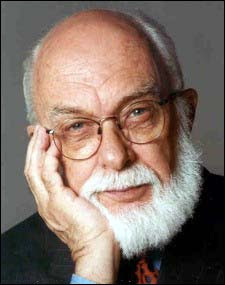 I've got two words for James Randi: "You ROCK, buddy!" According to his online biography, James Randi is a magician!! That doesn't surprise me at all, nor would I be surprised to learn that he's an excellent teacher. How do I know that? It's obvious: his followers can make solid truth vanish into thin air! So, in conclusion, I offer heartfelt thanks to the magician James Randi, and to his magical Educational Foundation, not only for an illuminating lesson in the fine art of deliberate deception, but more importantly for providing another example of the depths to which nominally smart people sink -- willingly, even defiantly -- to protect the perpetrators of an enormous and hideous and ongoing crime against all humanity. Many people find it much easier to deny obvious reality than to admit their complicity in monstrous evil. But this is a dangerous trap, because the longer they keep doing it, the harder it is to stop. Thus we see monstrous evil and implacable denial, working hand in hand, and spreading unchecked. As we can see -- from the mere existence of the "Stundie" series, and even more clearly by content of the threads themselves -- the enablers of all this evil are uncommonly proud of their work. But of course they are! If they had any sense of shame or decency, they would have stopped this nonsense a long time ago. The price of membership varies. You can get a Student membership for only $25, and a "Member" membership is just $100. Friends pay $250, and the scale goes on and on, all the way to Champions, who pay $25,000 or more. What's the difference? Friends get everything Members get, and in addition they get an autographed photo of James Randi. A bargain for the extra $150, if you ask me. Gifts of stocks and annuities are also most welcome. One final note, especially for those suffering Irony Deficiency: The people who buy this stuff call us stupid! ANOTHER UPDATE: It turns out that I was wrong about something. You don't need to join the Foundation in order to participate in the Forum. You can join for free using this link, which was kindly provided by Maccy in this comment. If you don't have anybody constantly telling you how stupid you are for doubting the government's version of events -- not only the events of 9/11 but any other event whose "alternative explanation" might be termed a "conspiracy theory" -- then run right along to the "Educational" Forum and rake in all the ignorant abuse you can handle!